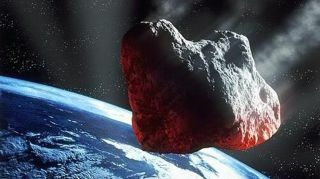 An artist's illustration of a dangerous asteroid headed for Earth. To date, astronomers have spotted more than 8,000 near-Earth asteroids that are at least 460 feet (140 meters) wide — big enough to wipe out an entire state if they were to line up our planet in their crosshairs. That sounds like good progress, until you consider that it's only about one-third of the 25,000 such space rocks that are thought to zoom around in Earth's neighborhood. A near-Earth object (NEO) is anything that comes within about 30 million miles (50 million kilometers) of our planet's orbit. The overall NEO population is almost incomprehensibly large; there are likely tens of millions of such space rocks between 33 feet and 65 feet (10 to 20 meters) in diameter, Johnson said. In 2005, NASA got some further instructions from lawmakers: Spot 90 percent of all NEOs 460 feet and larger by the end of 2020. It's clear at this point that the agency will not meet that ambitious deadline. And getting such a detailed handle on the NEO population will require the launch of a dedicated asteroid-hunting space mission, according to a& NASA-commissioned study that was published in September 2017. The space telescope for such a mission would ideally set up shop at the sun-Earth Lagrange point 1, a gravitationally stable spot about 930,000 miles (1.5 million km) from our planet, and scan the heavens in infrared light using a telescope at least 1.6 feet (0.5 m) wide, the study found. Such a mission's observations, combined with the contributions of ground-based telescopes, could probably bag the required number of 460-footers in a decade, Johnson said. NASA is already working on such a space project — a concept mission called the Near-Earth Object Camera (NEOCam). NEOCam was one of five finalists for the next launch opportunity in NASA's Discovery Program, which funds relatively low-cost and highly focused missions. NEOCam ended up missing out on that slot — NASA picked two other asteroid-studying missions, called Lucy and Psyche — but it did get another year's worth of funding. There's still hope that NEOCam will fly someday, Johnson said. An artist's illustration of the proposed NEOCam spacecraft, which would hunt for asteroids that could pose a threat to Earth. NASA and its partners around the world are working on potential solutions to this problem as well. For example, NASA aims to launch a mission called the Double Asteroid Redirection Test (DART) in 2020. If all goes according to plan, in October 2022, DART will slam into the 500-foot-wide (150 m) moon of the asteroid (65803) Didymos, which itself measures about 2,600 feet (800 m) across. This impact will change the orbit of "Didymoon" in ways that Earth-based telescopes should be able to detect, NASA officials have said. DART will be a demonstration of the "kinetic impactor" deflection strategy. NASA had also planned to test the "gravity tractor" technique — using a fly-along probe to gradually nudge an asteroid off course via gravitational forces — in the coming years as a part of the agency's Asteroid Redirect Mission (ARM). But the White House zeroed out funding for ARM in last year's federal budget request, and that mission is no more. Such preparatory work shouldn't unduly alarm the public, Johnson stressed; the odds that a big asteroid will strike Earth are very low on a day-to-day basis. "These are very rare events," he said. "But they're also an event that, if we don't find this population, can happen any day on us."